Do you have an event that occurs every week, month or year? 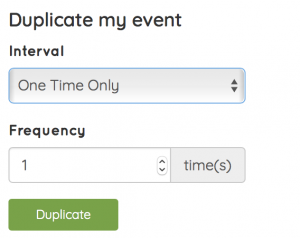 With Tangr’s new Duplicate feature you can make multiple copies of the same event and have them automatically change dates while all your information is repeated. Locate the event you wish to duplicate and select the duplicate icon located on the bottom right of the event card. Select the how often you wish to have your event recur and for how long. After selecting the duplicate button, your new events will be completed and located in your ‘Drafts‘ From here you can select each event, add details that are specific to that date and publish. Remember to publish to add the event to the Tangr event feed!